Reflections: "It was due to want of intelligence, somehow we moved in different ideological grooves"
"It was due to want of intelligence, somehow we moved in different ideological grooves"
Here I discuss the glimpses of EL to be found in two personalities who, between themselves, steered Indian consciousness for nearly half a century(1915-1963). Their ideologies condition many minds till date, not just in India but world over. 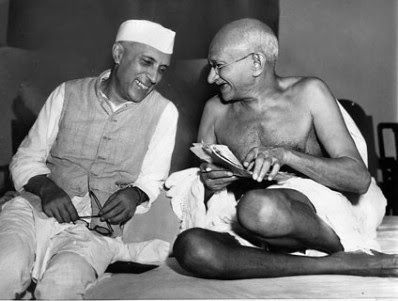 I am undoubtedely talking about Mohandas Karamchand Gandhi and Jawaharlal Nehru. I take the liberty of quoting Gandhi once again, "Before we dare think of freedom we must be brave enough to love one another, to tolerate one another's religion, even prejudices and superstitions." Here Gandhi has directly associated freedom or for that matter liberty with ones tolerance for the norms, values and cultures of others, be they superstitious and irrelevant in our eyes. The essence of liberty cannot be felt till we adopt an outlook of acceptance and tolerance. However, this never prevented Gandhi from starting the Harijan Movement, hence attacking the prejudices of upper caste Hindus. Here the prejudices of the so-called upper castes were negatively effecting the socio-economic condition of the lower castes, they being relegated to the periphery of the Hindu society and economy. One should be neutral to only those prejudices which are themselves neutral in nature. One can not accept a prejudice which has non-acceptance as its own foundation. Non-acceptance of the basic human rights of equality, equal opportunity and no discrimination on the basis of ones lineage, in the given case of Hindu society. Nehru, a proponent of the socialist philosophy, writes in his autobiography, "It has been my privilege to be associated very closely with a large number of Congress leaders and workers, and I could not wish for a finer set of men and women. And yet I have differed from them on vital issues, and often I have felt a little weary at finding that they do not appreciate or understand something that seems to me quite obvious. It was due to want of intelligence, somehow we moved in different ideological grooves. I realized how difficult it is to cross these boundaries suddenly. They constitute different philosophies of life, and we grow into them gradually and unconsciously. It is futile to blame the other party. Socialism involves a certain psychological outlook on life and its problems. It is more than mere logic. So also are the other outlooks based on heredity, upbringing, the unseen influences of the past and our present environments. Only life itself with its bitter lessons forces us along new paths and ultimately, which is far harder, makes us think differently. Perhaps we may help a little in this process." Nehru shows ones helplessness in choosing his/her ideology, outlook or value system. We may regard ourselves individualists but still our surroundings play a decisive role in conditioning our mindsets. There are few who are able to break the shackles of the norms and values, and hence think independently. However, even this independence is nothing but just fiction. As Nehru says, its not our intelligence but the lack of it that shapes our ideologies and make them different from others. It is the limitation on our part that we are not able to comprehend the ideologies of others. Hence the onus lies on an individual to remove the layers of indifference which gradually accumulate between us and open ones mind and intellect to polemics of others. Maybe through our receptivity, we can set an example for them too and the polemic gets moderated to a healthy discussion which goes on to fill that lacunae of our intelligence. Further moving on the steps of Nehru, I too acknowledge that it is not easy to bridge this gap. However, the try is worth it. He stays his frugal self and is familiar with that despite the fact that shopping for fresh groceries may be a touch more luxurious it is quality ultimately. I am so https://www.gethomeworkonline.com proud to call him my dad. The teens football association notes that six of the top seven reasons that youth quit sports are adult-inspired conduct.